Caleb Ferris (1782-1883) was the great-great-great-great-grandson of Jeffrey Ferris through his son Joseph. He was one of at least eight children and, through two wives, he also fathered at least eight. 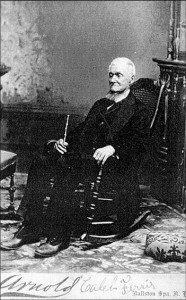 Two wives, eight children and, oh, yeah, he lived to be 100 years, 11 months and 4 days old. At some point in his life, Caleb and his brother, Orasmus, went to the Fairfax, VA area and began a brick making operation. He is recorded as living there in 1850 and 1860. The brother stayed behind and was a staunch Union supporter. 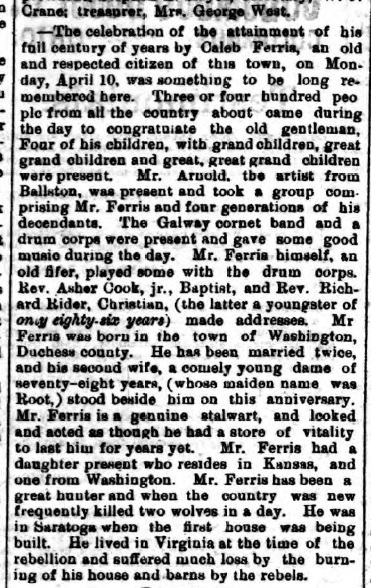 The Saratoga Sentinal, in April 1882, noted the town-wide celebration of Caleb’s 100th birthday.